The European Free Alliance (EFA) Group in the European Parliament currently includes representatives from Scotland, Catalonia, Galicia, Wales and Latvia. EFA MEPs advance the cause of Europe's stateless nations, regions and disadvantaged minorities. 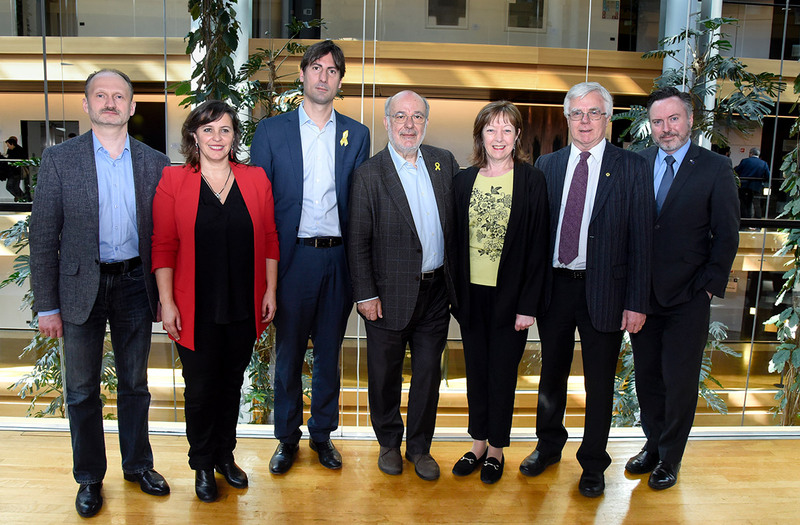 Current EFA MEPs are Josep-Maria Terricabras (EFA Group President), of Esquerra Republicana de Catalunya (Catalonia), Jill Evans (Vice President) of Plaid Cymru – the Party of Wales, Ian Hudghton (Vice President) of the Scottish National Party, Ana Miranda of Bloque Nacionalista Galego (Galicia), Jordi Solé of Esquerra Republicana de Catalunya, Alyn Smith of the Scottish National Party and Miroslavs Mitrofanovs of the Latvian Russian Union (Latvia). European Free Alliance MEPs sit in a joint European parliamentary group with the Greens, making up the fifth largest group in parliament. EFA Members of the European Parliament are members of the Greens/European Free Alliance Group in the European Parliament, forming a common parliamentary group since the European elections of 1999. The European Free Alliance (EFA) draws together political parties fighting for democracy and self-determination for the stateless nations and regions of Europe. We are committed to democratic, constitutional and peaceful means. EFA’s work and campaigning is underpinned by the core principles of social justice and equality. EFA MEPs have achieved greater recognition for Europe’s stateless nations and have highlighted the discrimination faced by minority language speakers. The group are powerful advocates for Europe’s disadvantaged regions, fighting for fair play when the EU decides how to spend its structural funds. Our group has also been particularly active in exposing human rights abuses across the world and in defending civil liberties. As far as the European Free Alliance Political Party is concerned, it was established in Barcelona in March 2004. It was one of the first Europe wide political parties to be established and has its headquarters in Brussels. The current President of the EFA Political Party is Lorena López de Lacalle of Eusko Alkartasuna (Basque Country). You can check the EFA party website here.